Dana’s engine thermal-management products offer superior cooling properties to reduce thermal load for improved performance and durability in high-load situations. This type of design is normally mounted remotely from the engine block. It is well suited to applications where additional oil cooling is required over the original design intent of the vehicle (i.e., increased trailer tow, large engine displacements, and heavy-duty applications). In this class of Long® remote-mounted engine oil coolers, there are two types of designs and mounting options. When mounted directly in an air stream, this application is most often applied in front of the radiators. 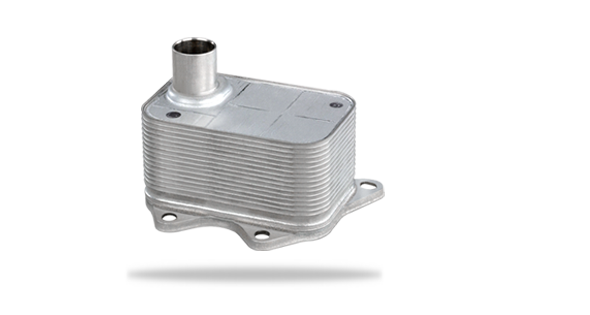 Cooling occurs by passing hot oil through the cooler via fluid lines coming from the engine and ambient air passing through the core of the oil cooler. With a liquid-to-liquid remote oil cooler, engine oil and coolant are both fed to the oil cooler via fluid lines coming from the oil and coolant circuits, respectively. This design can be mounted anywhere there is room to package it under the hood. Optimal performance is achieved when the hot oil and cold fluid (glycol/water mixture or air) have the greatest inlet temperature difference.